2979 - Tasmia Mallor is born the daughter of Talos VIII's shadow champion. She is raised by monks to develop the skills to wield her ancestral shadow powers. 2994 - 15-year-old Tasmia's mother dies defending their planet. She and her brother Grev undergo the trials to become their planet's new shadow champions. 2997 - 18-year-old Tasmia chooses to leave Talos VIII when it is contacted by the United Planets. She joins the Legion of Super Heroes, leaving Grev as her planet's sole champion. 3000 - 21-year-old Tasmia is lost in a distant galaxy. She nearly dies fighting the progenitor's forces, but is kept alive by Imra Ardeen. When the Legion of Super Heroes disbands she returns to Taols VIII to heal. 3005 - 26-year-old Tasmia is contacted by Querl Dox as he reforms the Legion of Super Heroes. Increasingly dissatisfied with her planet's growing isolation, she defies her people and leaves to rejoin the Legion. Shadow Lass (or Umbra, for people that tuned in later on) is one of the all-time most popular members of the Legion. 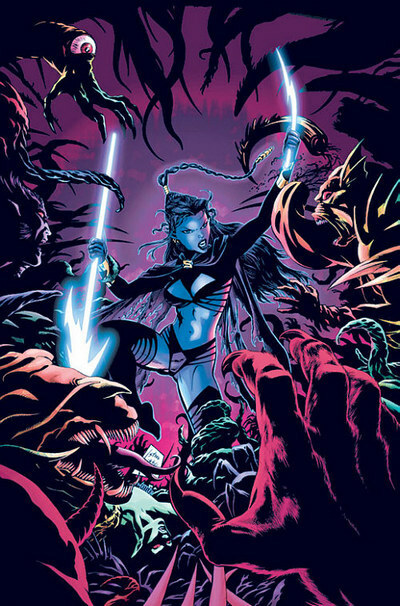 she has a unique drow-like look and very cool powers; she was so popular that a version of the character was created as a member of the modern day Legion of Superheroes equivalent team, L.E.G.I.O.N. She has a cool, ancestral power source that we expanded a bit, making her a really great addition to the team. Of course, that's not really the MAIN reason that shes' so popular. She was created in an era when comics were really starting to lean into the idea of having their female heroes try to fight crime in what amounted to swimwear. She's not the MOST scantily clad female superhero ever created (that distinction probably goes to Vampirella or any of the myriad 90's era female heroes), but she's definitely up there. Unlike a lot of heroines that have gone through a phase of being kind of ridiculously under-dressed (which last time I checked was all of them), It seems to be part of the fabric of the character design for Tasmia. There has to be a line somewhere where she's more thoroughly clothed but still has whatever mystique that drew people to her in the first place. This is definitely a character that is ripe for some really interesting new costume design.